Since 1915, experienced cooks and beginners alike have reached for Pyrex glassware products. 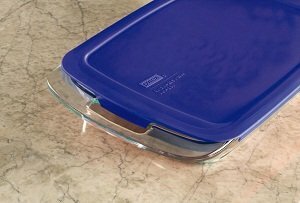 It all started with our glass bakeware � loved for generations because it's affordable, durable, odor and stain proof, and great for cooking, serving and storing. Since then, new favorites have joined old standbys. The Pyrex line now includes products for the entire kitchen, including pots and pans, metal bakeware, and kitchen tools and gadgets. They're all designed and proven to make cooking a little easier. Today, over 70 percent of U.S. homes have Pyrex glass products, with many cooks passing them down from generation to generation � which we think is pretty neat. A great addition to any kitchen, the Pyrex Easy Grab series lets you easily keep an eye on how your cakes, breads, casseroles and more are cooking up. Versatility makes it easier for you with these cook-and-serve in one dishes that go from the oven to the table. Use them for dry or refrigerated storage and microwave reheating and enjoy maximum functionality with minimal mess. Limited 1-year warranty on plastic cover.